This is an antique style drill chuck seen in many of the drill press advertisements during the late 1800's and early 1900's. The Standard #2 Improved chuck has an #3 Jacobs Taper (3JT) standard arbor hole like many modern chucks. This drill chuck (photo at right) appears to be still very serviceable despite a very small crack in the thread of one jaw that was discovered during cleaning and inspection. The Standard #2 Improved drill chuck will grip modern straight shank drill bits from 1/8th to 3/4ths of an inch. This chuck consists of a main body, two threaded sliding jaws, a large double threaded screw and a cover plate and retaining screws. 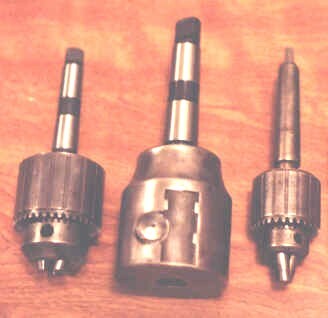 The Standard #2 Improved drill chuck in the photo at right, is mounted on a 3 MT taper shank arbor. For comparison the photo (at right) shows a Standard No. 2 between a pair of half inch Jacobs chucks. To the left of the Standard #2, is a No. 6A Jacobs chuck mounted on a No. 2 MT arbor. To the right of the Standard #2, is a No. 32 Jacobs chuck mounted on a No. 2 MT arbor. Note the difference in size of these chucks. The Standard number 2 is a 3/4ths inch chuck while the two Jacobs shown beside it are 1/2 inch chucks. Of course Jacobs 3/4ths inch chucks are also quite a bit larger. 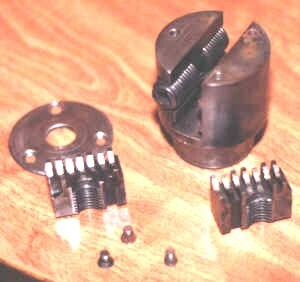 The second photo (at right), shows the Standard No.2 chuck disassembled. The working ends of the jaws are machined with a series of teeth which are offset so that they pass through each other as the jaws are opened or closed. The effect is to allow the 'V's of jaws to close around the shank of the drill bits. 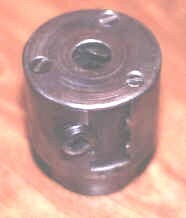 A square hole is machined into the end of the double threaded screw which allows a simple key made by the machinist or blacksmith to be used for tightening the drill chuck. A very simple chuck, the jaws are basically two identical halves that slide apart, or together when the double threaded screw is turned. The third and final photo at left, shows the bottom side or drill bit side of the Standard No. 2 chuck. The chuck key is a square bar with a handle which can easily be fashioned in a few minutes by the blacksmith. Latest update October 06, 2010. Page created on June 8th, 2000.